My friend Richard Oram has dreamed forever about opening an authentic British Pub, and this year, despite the bad economy and gloomy business forecasts, he made his dream a reality. The Union Jack Pub will open this month in the heart of Old Town Winchester, Va. 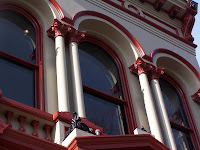 He spent the last year restoring the Victorian Cast Iron Union Bank Building to its 1878 glory. He stripped out the horrible drywall and drop panels that had found their way in over the years and brought back the 20' ceilings and grand windows overlooking the Old Courthouse. He painted the interior warm shades of red, gold, and sea-foam with deep black trim, and put in a 50' bar with 40 European beers on tap. Upstairs in the "British Invasion" room he put in a sound stage, dart boards and skittle lanes so people will gather. I feel certain that with the care and attention that Richie has put into this Place the crowds will come despite the economy. Besides, Richie reminds me, "People drink more beer the worse the economy gets:-)" All I know is that the thought of Cream Tea and fresh-baked scones is appealing right now, and I feel certain that this Place will help draw energy into Old Town.